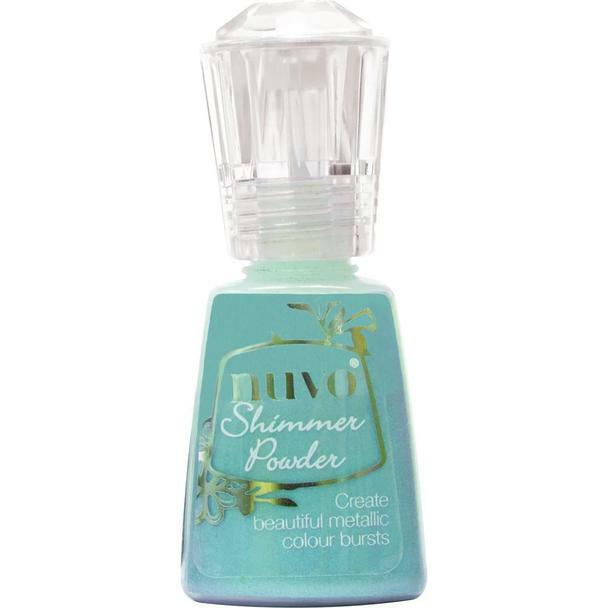 If you saw my unboxing, you will know that I was a little stumped as to what this beautiful bottle of Nuvo Shimmer Powder could be. 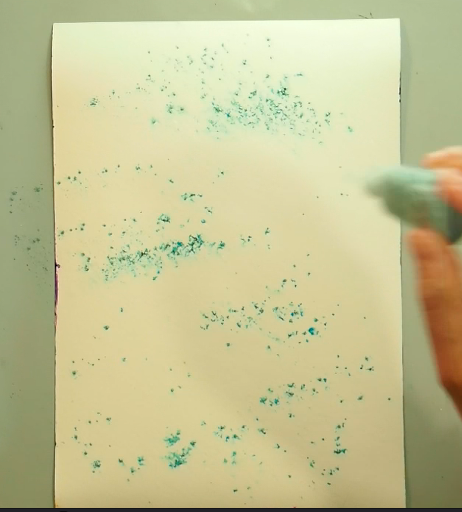 I thought, at first, that it could be applied as a fine powder to make your projects shimmery - much like Perfect Pearls. But then, I added water!! Did you see Suzanne's Unboxing and how she tested it on her hand? She's awesome! Thats why she's on our design team. 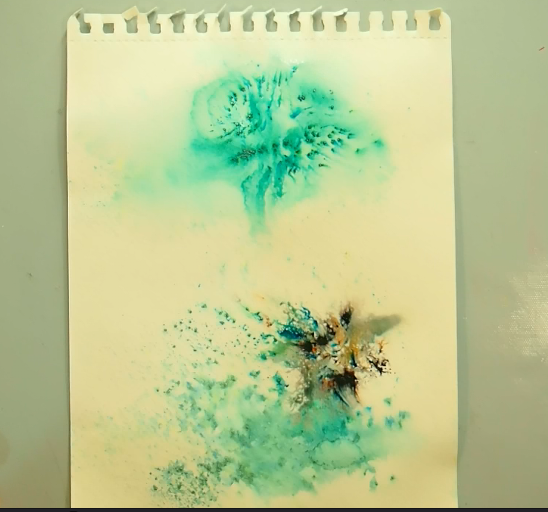 So I started off by misting water color paper with water and then I sprinkled the Atlantis Burst on top and immediately I was hooked! You can spend ALL DAY making beautiful shimmery backgrounds. 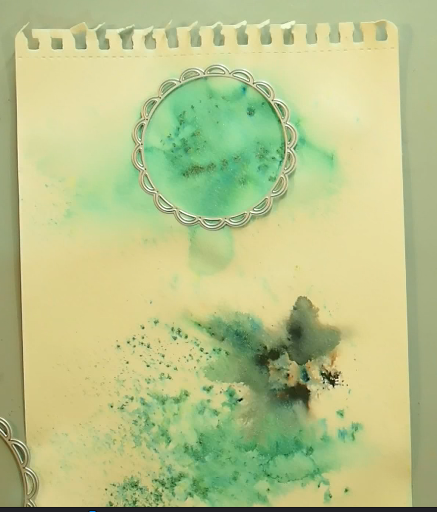 And there are different subtle colors mixed in with the powder- yellows and greens. It's just so pretty and two backgrounds can never be the same. The look you get depends on the amount of water you spray. 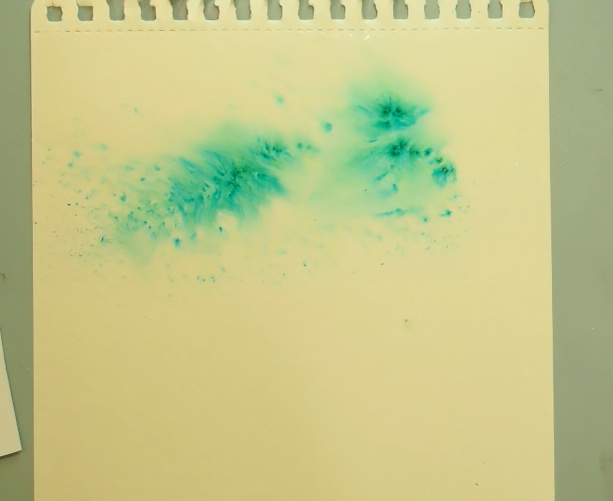 In the following picture, I misted, then sprinkled then kept on misting to dilute out the color. 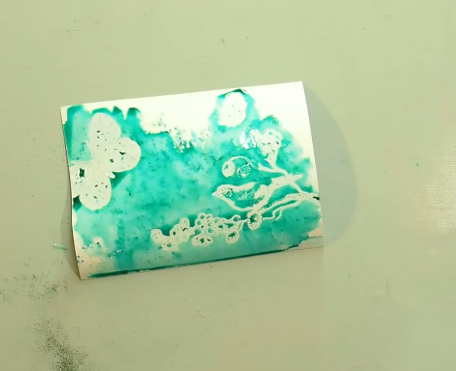 See how dreamy and water-colour like an effect you can get. For the bottom half, I misted then sprinkled and left it alone. I do love the concentrated and speckled designs. 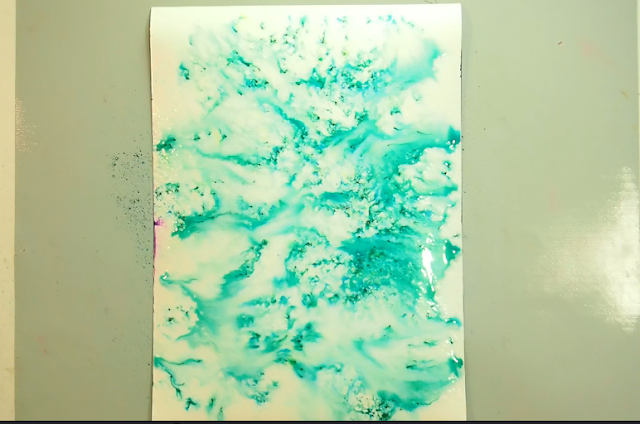 This is what it looks like when it dries. 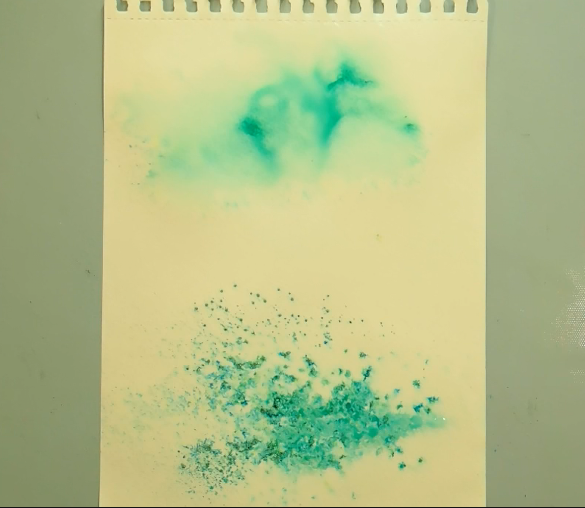 I misted over the bottom half and added another colour (Black from the Brushos line) and watched as the 2 colours mixed and married. 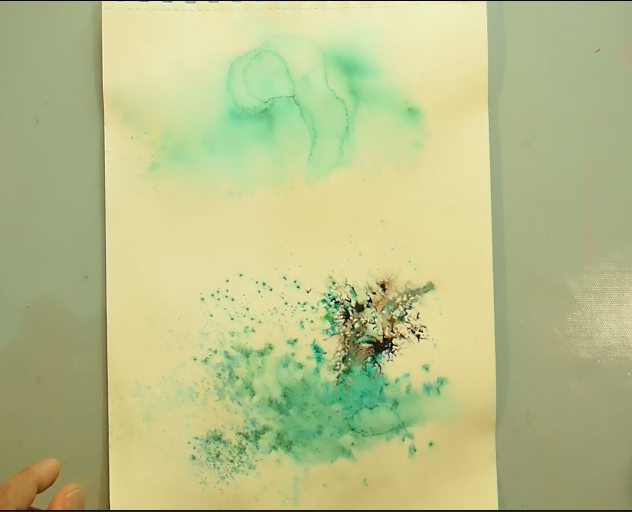 Notice how light that first application became when it dried. I wanted it to be more vibrant so I re-misted and sprinkled on some more Atlantis Burst. Look at the pretty design!! These would make excellent elements on cards and art journal layouts. Just grab one of your dies and an interesting part of the background. 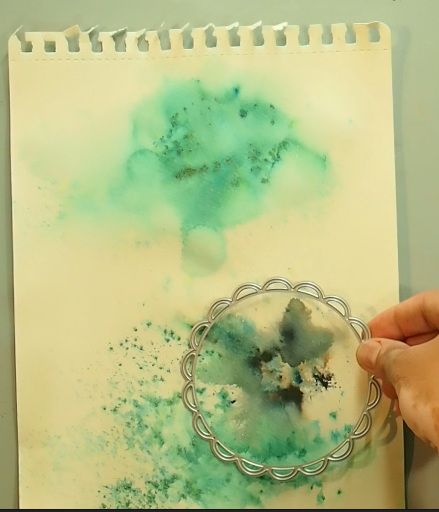 I wanted to capture the step by step magic that happens (also see the video- link at the end of the post). After misting with water, sprinkle shimmer powder. 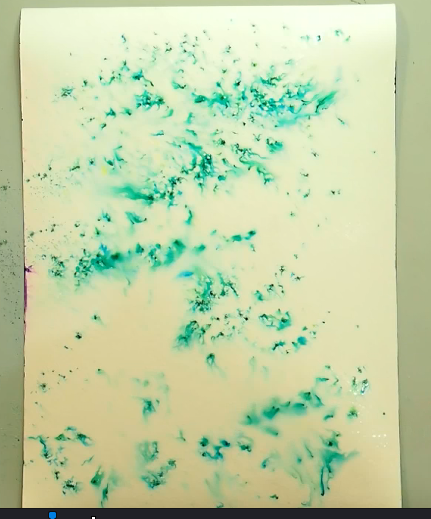 It's a beautiful symphony of capillary action and osmosis where pigment travels from places of high concentration to places of low concentration and along water tension marks. Notice also the different colors- yellow, blue, green. If the little concentrated clumps of pigment bother you, mist again and again and watch the waves of colour drown out your white space. After hours of play, and when the children started begging to be fed and tucked into bed, I came back to create some cards with these beautiful backgrounds. Here I used a 4.5" x 5.5" water color paper panel and applied the Atlantis Burst in the centre and was careful to preserve some white space. 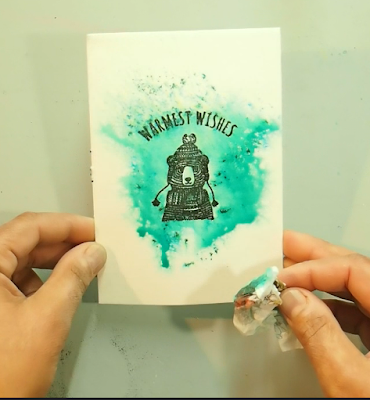 When it was dry, I stamped with Versamark Ink, sprinkled on some extra fine black embossing powder and heat set it. This is a simple way to make a mixed media card. Or, you can die-cut it and add it as an element to another card. and ribbon from the Santoro Gorjuss Ribbon Pack. 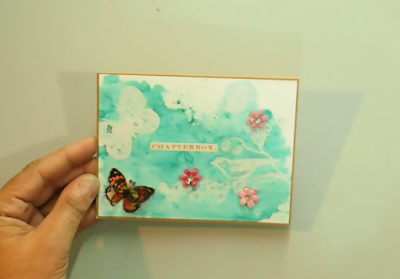 For this card, I stamped out a scene using Versamark and clear embossing powder and then I misted and sprinkled on the Atlantis Burst. Serious magic happens there as the stamped scene emerges before your very eyes. 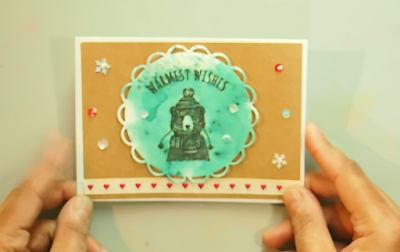 All you need to do is add some embellishments and a sentiment and this card is just beautiful! I cant wait to get some more colours! Does it come in pink??? Now the one thing these pictures CAN NOT show you is the AMAZING shimmer on the backgrounds when they dry. Thank you so much for tuning in today. Go get yourself some Shimmer Powder and have hours of fun in your craft room.